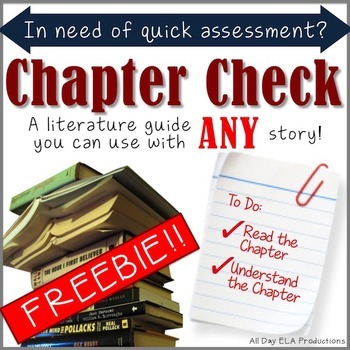 Chapter Check- A *FREE* Literature Guide for Comprehension! Chapter Check is a template that can be used for ANY story! This can be used as a quick assessment for the teacher, as well as a comprehension tool for the student to look back on to help studying for the exam! There are *TWO* options for different levels of learners. Adapt to your classroom to suit your needs! Oh, and did I mention that it is FREE?! Rip Van Winkle- A Mini Unit!Henry Wadsworth Longfellow- The Ropewalk and The Cross of Snow Mini-Unit!Thanatopsis- A Mini-Unit!The Devil and Tom Walker- *MEME* Activity Included!- Mini-Unit! Emerson: Nature and Self-Reliance Mini-Unit! The Minister's Black Veil Mini-Unit! In need of FUN activities to do with your students? Take a look at these great lessons that get your students up, moving, and PARTICIPATING! Public Speaking Activity! Minute to Win It Improv Debate! Edgar Allan Poe- A CSI Activity! Was he MURDERED? •	Look for the green star next to my store logo and click it to become a follower. BAM! You will now receive email updates about this store!